Having another member of the family. Seeing your neighborhood in a new light. and sleeping together with warmth. Bridging the gap between families and friends. And teaching you the meaning of a wonderful life and death. I'm happy just having my dog by my side. like I hold the hand of my lover. 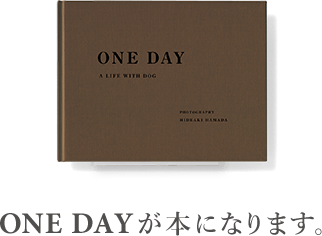 ONE DAY is a documentary magazine. We document the dally life of people who live with dogs. we search for how to enrich our own. The photos and movies in ONE DAY are taken by up-and-coming photographer, Hideaki Hamada. Please enjoy his original and heartfelt perspective of life with dogs. This web site has been produced by dog goods brand "free-stitch". Born in 1977 on Awajishima, Hyogo Pref. Currently living in Osaka. In September 2012, at 35 years old, he became a free-lance photographer after being designer for a number of years. In December 2012, he published photo book "Haru and Mina" in Taiwan. He works on international magazines such as "KINFOLK"(U.S) and "THE BIG ISSUE" (Taiwan). Also he works for internal magazines, advertisements and commemorative photos.